In the living area, Cristian says, “The worst thing we can do is make Joel feel uncomfortable.” Sally says, “Treat Joel exactly the same.” Joel exits the Diary Room and joins the others in the living area. Nick says, “No one’s angry at you, Joel.” Chloe reiterates this. 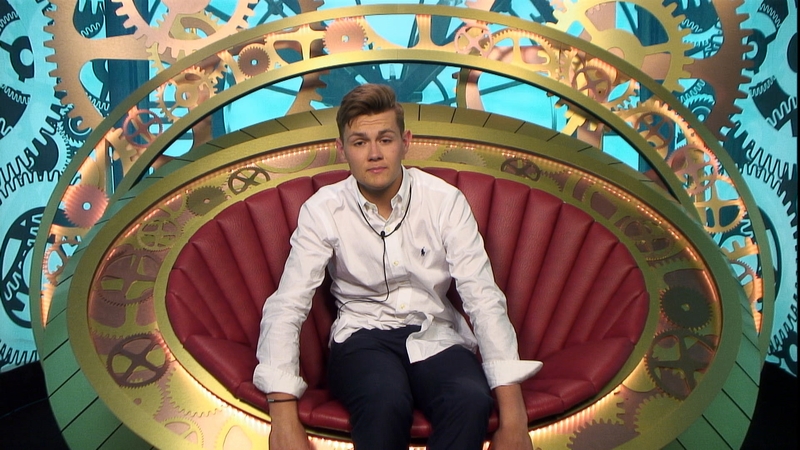 Sally and Amy are in the Diary Room talking about Aaron and the eviction. They are talking about the housemates being nervous about the evictions. “If Aaron has gone, it’s one less person that’s up.” They guess that Nick or Jade will be evicted on Friday. Sarah and Danny are in the smoking area. Sarah comments that she thinks she saw Joel smirk when it was announced that Aaron was removed. Later on, Joel, Sarah, Nick, Jade and Amy are in the smoking area. Joel asks Sarah if there is something wrong. Sarah tells him that they need to have a conversation but she will wait till the morning because they have all been drinking. Joel insists that they settle things immediately. An argument breaks out where Sarah tells him that his behaviour in the wake of Aaron’s departure has been inappropriate. Joel asks what Sarah’s reaction would have been if she had been in that situation. “No one in this house would do that to me because I would have made it extremely, unequivocally clear that that was not on.” says Sarah. Nick tries to defend Joel but Sarah tells him not to get involved. Big Brother’s big eviction twist takes place tonight at 9pm on Channel 5.